Authors: Dominique Ebbenga, Eric Burkness, Matt Clark & Bill Hutchison. The recent “onslaught” of JB on fruit crops has raised new concerns and questions about their variety preferences and control thresholds. UMN entomologists have been researching the answers to these questions, and share some interesting findings in this article. Fig. 2. 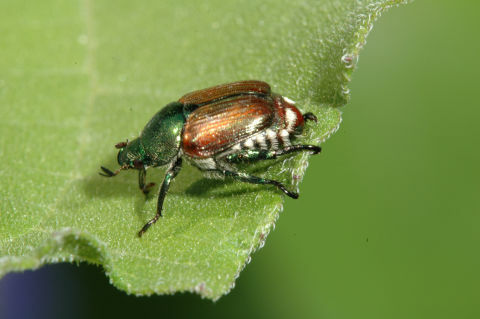 Adult Japanese beetle on a leaf. 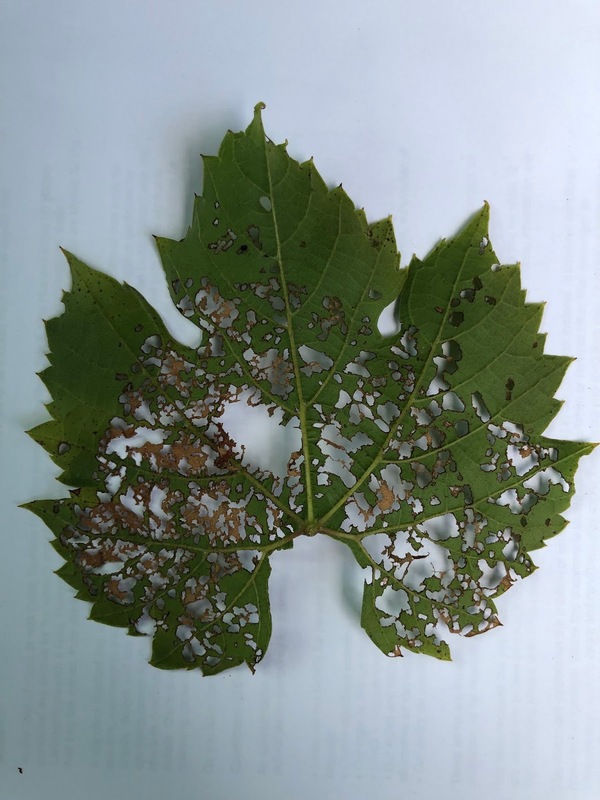 In 2018, we evaluated JB feeding damage on several raspberry and wine grape varieties grown in Minnesota. These studies aimed to quantify mean density of JB adults present (meter-row samples), and the corresponding level of defoliation (% per leaf). See Fig. 3 to visualize what 10% defoliation looks like. Raspberries: Two popular summer raspberry varieties, ‘Prelude’ and ‘Nova,’ were screened for JB. Results indicated that JB adults showed a preference for the variety Prelude with an average of 22 adults per meter, and average defoliation of 5.39% per leaf (Fig.2). 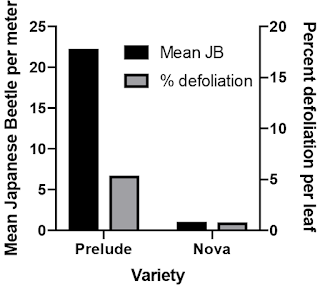 Conversely, Nova only averaged one JB adult, and 0.82% defoliation (Fig. 2). Although not presented here, a popular fall raspberry variety, ‘Heritage’ harbored JB densities that were intermediate between Prelude and Nova. It must be noted that defoliation may look worse in the field than what it actually is when measured in a lab. The photo below (Fig. 3) may look like about half the leaf is gone, but it is actually only 10% defoliated when analyzed with lab-based leaf area software. This level of defoliation does not necessarily translate to yield loss. Fig. 4. Average Japanese beetle adult density per meter-row, and corresponding average percent defoliation per leaf, for two popular summer raspberry varieties. Berry Patch Farm (K. Edberg), Forest Lake, MN, July 2018. Grapes: Wine grape varieties were also evaluated for JB activity and defoliation, with 8 varieties screened (Table 1). While defoliation did occur, these data do not necessarily translate to yield loss. Still, the results can be very useful in selecting future varieties for new plantings. 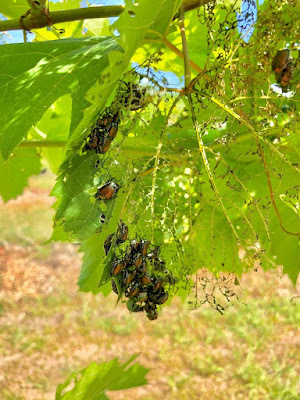 The “new normal” for fruit pest management in Minnesota, is that invasive species are likely here to stay, and that more long-term planning and research will be essential to build more effective, sustainable IPM programs. Further studies will be needed to determine what defoliation levels are necessary to cause economic yield and quality losses. Additional results will be published in future articles to assist growers in understanding the biology of JB, and how this information, along with additional pest management tactics can be useful for building sustainable IPM programs. Please refer to the FruitEdge web page (www.fruitedge.umn.edu) for new research-based updates for managing JB and other insect pests of MN fruit crops. Bill-you can include Boyne Raspberry in the low loss category. I didn't see a ton of defoliation, nor was there any loss in yield. In fact, I had more JB defoliation overall this year, however the largest Raspberry yields yet in 3 yrs of production. Canes, leaves, and fruit fared very well. Way more damage to Sommerset and Trollhaugen table grapes in a completely different area of our parcel. Will be netting those next season for JB.